Rice is a dietary staple for a huge part of the world’s population and therefore features in the cookery of many different cultures. It is an amazingly flexible food that can be milled into flour and made into bread. Although starchy it is very different from wheat and contains no gluten. When it comes to cooking, it’s useful to have an understanding of the differences between types of rice so you can judge which is most suitable for your purposes. Long grain rice is the slender cylindrical grains familiar from supermarkets. Short grain rice is almost round in shape and keeps moisture well. It takes slightly longer to cook. Glutinous rice is very starchy and used for making sushi as well as other Asian dishes. Arborio rice is an Italian grain of rice used specifically for making risotto. Wild rice is a slightly different species with high nutritional content. Cooking glutinous rice or risotto requires specific and detailed techniques so it is simpler to deal only with cooking the most common types of rice here. Long grain and short grain rice may be either white or brown. Brown rice has had only the outermost husk removed and could be considered roughly equivalent to wholegrain wheat. White rice is made by further milling which removes the bran and germ from the seed. This process strips many of the naturally occurring vitamins, minerals and amino acids from the grain but results in a less perishable foodstuff. In terms of nutrition, flavour and texture, brown rice is almost always preferable. And after having always had to live in the shade of its more polished and popular cousin, it is now the more expensive and hard to find. The best way to cook rice is the water absorption method, using only as much water as necessary to cook the rice. Any time water is drained from cooked rice, some of the nutrients go with it. 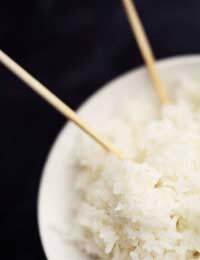 White rice needs a ratio of about three cups of water to every two cups of rice and generally takes a little over 20 minutes to cook. Brown rice should have two cups of water for each cup of rice and can take up to 40 minutes. First heat the pan you wish to cook the rice in and, when moderately hot, add the dry rice. The hob should then be immediately turned to its lowest setting as once the pan is hot only a little further heat is necessary to cook. Use a wooden spoon to keep the rice moving so that it doesn’t get the chance to burn. The idea is to toast the grains slightly to bring out the natural nutty flavour. For the kind of fluffy white rice where the grains slip easily off each other, a small slug of sunflower oil added at this stage can help to seal the starch inside the grains before the water releases it all. The point is not to fry the dry rice, it should simply be toasted and then given a light coating of oil. When boiling water is added to the pot, the starch on the outside of each grain of rice begins to dissolve immediately. It is important not to stir rice once it is in the pot. Doing so will cause much more starch to be released, turning the water cloudy and then congealing on the surface of the grains making them sticky and prone to burning. Adding salt to rice is unnecessary. The osmotic pressure it introduces will encourage the rice to release even more starch into the water, impairing the texture of the finished product. Once water has been added to the pot, the aim is simply to let it simmer until the water has all been absorbed and the rice is cooked. The best way to tell when it is cooked is to try a bit. It should be firm enough to still offer something to bite but without any of the chalky texture in the core of each grain that means it has not yet cooked entirely through. It is important to note that cooked rice should be regarded as a moderately high risk food in terms of its potential to bring about a nasty case of food poisoning. A particularly virulent species of bacteria called Bacillus Cereus is often found in rice. Lying dormant in the dried grains, it can survive the cooking process and awake to flourish in the warm, moist, pathogen-friendly environment of incorrectly stored rice. It is therefore very important not to leave rice at room temperature for more than an hour or two and not to store cooked rice in the fridge for more than a couple of days.